Graves Motorsports Yamaha High Precision Cam Chain Tensioner for the R1 / R1S / R1M 2009-2018, FZ10 2017 and the MT-10 2018 models (also fit all model year Super Tenere). 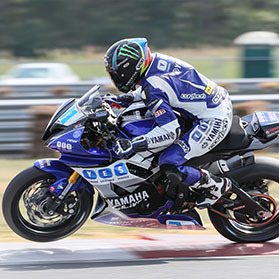 Professionally developed under strict guidelines for use in the Graves Yamaha factory race bikes. Note: You will need need a replacement timing cover gasket and cam chain tensioner gasket from your local Yamaha dealer. Adjustment shaft is made of aerospace quality steel machined to a 1.0 threads per millimeter allowing the tuner to adjust the tension on the chain to an exact specification = less friction and consistent cam timing = more power. Designed to support the shaft as close to the cam chain running block as possible for maximum shaft support and minimum shaft flex. The body is machined to allow the exact amount of oil exiting the body to minimize over oiling of the valve train area at high rpm. All of this = more power, accurate cam timing and less friction. You can compare the price but you cannot compare the quality. Take both of these to your engine builder and ask them which one they would install in your motor when their reputation is on the line! Very well made CCT. Don't get anything but this CCT for your 09-14 R1 in my opinion.